For mobile use the system is powered from a standard 80 Ah, 12V lead battery. This is enough for playing 3-4 hours. The battery is placed under the feeder crankshaft. This photo shows its immediate environment when the battery is removed. Connections are concentrated to a clip-on contact bar, here less a protective cover. The bar holds contacts for remote meters for voltage and current, for an 'intelligent' battery charger, and for accessories. Apart from the chest magnets these accessories include the MIDI diskette reader and the master keyboard. These are originally equipped with 220 VAC adaptors. At present they are powered via an inverter from 12 VDC into that mains voltage, an obvious area for future rationalization. 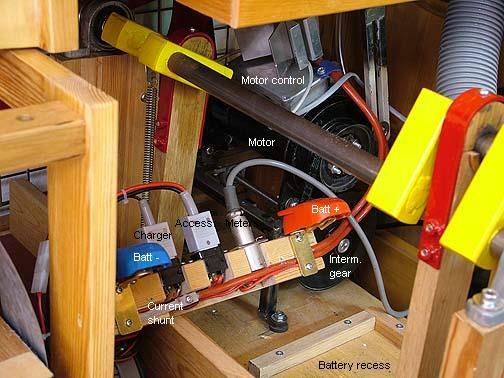 In the background of this photo you see the feeder drive motor with its control box and its intermediate gear shaft. 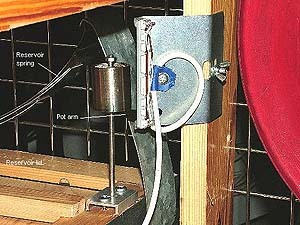 These are mounted on a cradle, pivoting around rubber washers, one of them seen below the contact bar. The belt connecting the intermediate shaft to the crankshaft is tensioned by a spring, hardly visible below the intermediate gear wheel. The meters for voltage and current are located up on the right pillar for easy reading. Their ranges are modified to suit the application. In normal free standing use air is supplied by the bellows, powered from a battery driven motor. 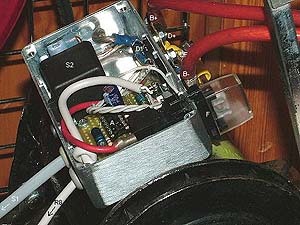 This motor is an old style 12VDC car generator, slightly modified. The speed of this motor is controlled such that the air reservoir lid is held at an intermediate position, sensed by a linear potentiometer, R8 in this diagram. A1 is an oscillator, astable multivibrator. Its hysteresis is controlled by the positive feedback network R1-3 and its frequency by R5-C1, with the elements shown about 8 kHz. In A2 the sawtooth at C1 is compared to the voltage of the bellows sensing potentiometer R8. This results in a pulse width modulation signal at A2 output pin 1. I had to insert an emitter follower Q1 for sufficiently fast drive to the power FET Q2. When everything is turned on by switch S1 and relay S2, the slow charging of capacitor C2 implements in a raw and simple way a smooth acceleration of the motor, no overly big start current. I did unsuccessfully try some ways to make an over current cutout by sensing the drop over the fuse F. Skipped that after all, did not seem too necessary. The fuse remains from earlier versions, but I doubt it is very meaningful. I modified the car generator somewhat, insulating its second brush from the grounded case. Also swapped to connect that one to the 'DF' terminal rather than the field winding, instead field was connected to the case. The terminal denominations in the diagram are after modification - the original generator was not internally connected the way shown. The pulse width modulation of the supply to the rotor controls the average voltage across it (between D+ and DF) to be from essentially zero up to the battery voltage. This voltage is about proportional to the motor speed, in turn connected to airflow delivered. On the other hand the average current through the rotor is in proportion to the torque delivered, and this torque is essentially constant since pressure in the driven bellows is independent of how much air is consumed. But this current is drawn from the battery only at the open part of the duty cycle, when Q2 is turned on. With Q2 off the same current flows in the rotor (due to the inertial effect of its inductance) with a return path though the 'freewheel diode' D1. The result is that the average current and power drawn from the battery is proportional to air usage, despite the fact that motor current is constant. This photo shows my endeavors to cram everything into a small metal box, riding piggyback on the motor. It remains a bit awkward to me how to unite such miniature electronic circuits with the high current power ones, connected with nuts and bolts rather than tiny solders. The power semiconductors D1 and Q2 are mounted on insulating washers inside the box, using the same bolts as for the middle two external connections. Q2 fused a couple of months after this photo. The replacement was mounted on a big external heatsink seen in the top photo of this section. The control potentiometer R8 is a linear one made for mixer consoles. I connected its two 10 kohm stereo runs in parallel to have a 5 kohm pot with possibly less noise. The picture shows the rig with the reservoir bellows lid in empty position. In the lower half of the lid travel the pot arm is held in its bottom position (for full motor speed) by a weight sliding on the vertical guide pin. The upper half of its travel the lid pushes the pot up over a 60 mm range. The 8 kHz magnetostriction whine from the motor is faintly audible but does not disturb the music. I prefer to keep it for a while, just as an operator's check that everything works as it should. Later I might reduce C1 to make it supersonic. One feature of the connections layout is that if (or when?) the electronics break down, then I can move the motor DF cable to the adjacent B- terminal and let the motor go at full speed all the time. Then it is up to the old proven reservoir valve regulation to take over, though more noisy and jerky. Practically, this setup works fine. The battery consumption is about 13A, rising to some 17A when playing loud. Some power saving, but not very significant. The assembly becomes a bit hot, some 65 deg C, at continuous use. As far as I can judge the heat comes from the motor rather than the electronics. Using this speed regulation there is now much less rumble from the bellows when the organ idles, because of reduced speed, crankshaft only at about 20 rpm. Full speed 45 rpm is reached momentarily at loud passages. This is a very pleasing improvement, the one making the speed regulator adventure really worthwhile. Here is a video recording (15 MB) seen from the opposite side. It shows how the reservoir is rapidly filled when the motor is started. Since the soundtrack has automatic gain control the background noises and bellows squeaking are prominent. After a few seconds music starts vigorously such that the reservoir lid dives, but the regulating system catches up fast. It is difficult to perceive that the drive wheel speed varies a lot.